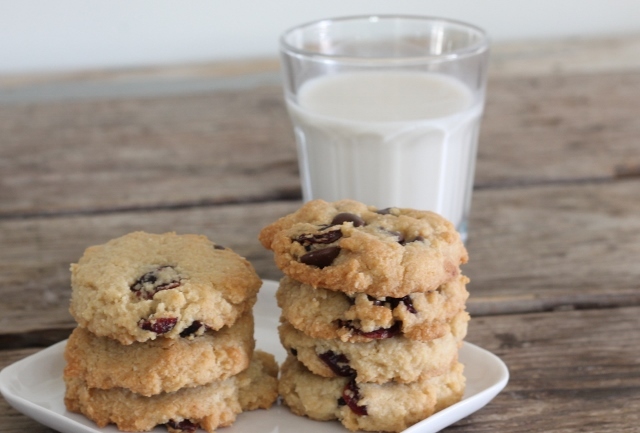 Today I’m sharing my recipe for Almond Chocolate Cranberry Cookies with you. It’s super simple, just six ingredients AND they ship very well, making them perfect for holiday gifting. Which brings me to this: The Great Food Blogger Cookie Swap! 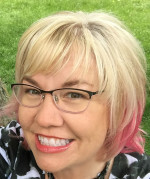 I participated for the first time this year, along with over 500 other food bloggers. This year was the 4th annual Great Food Blogger Cookie Swap, hosted by Julie and Lindsay. It is a fundraiser for Cookies for Kids’ Cancer. Since 2008, Cookies for Kids’ Cancer has helped to fund 4 dozen childhood cancer research grants, leading to 9 promising new treatments now in clinical trial, available to children fighting cancer today. Cookies for a great cause! 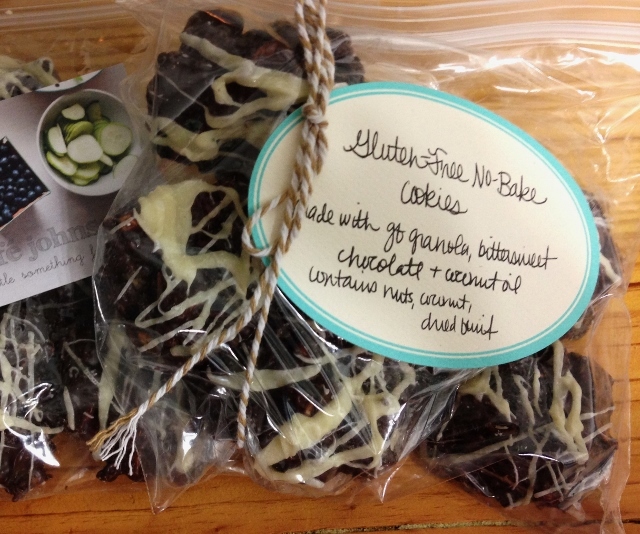 I shipped cookies to Elle of Only Taste Matters, Rachel of Roasted Beanz, and Rachel of Following In My Shoes. And then I got three boxes of cookies in the mail! Cookies I could eat, all gluten-free. This cookie swap thing really works! 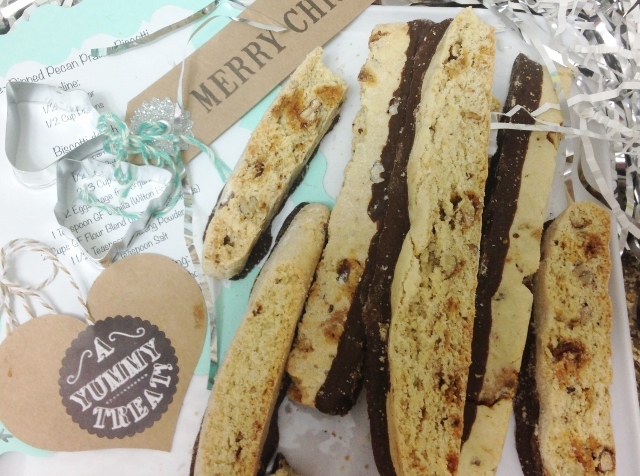 Then there was this Chocolate-Dipped Pecan Praline Biscotti from Jessica at Sassy Southern Yankee. I have to tell you I’ve never really been a biscotti fan. I am now. I can’t wait for the recipe for this! The packaging and cute accoutrements Jessica added to this package had me grinning from ear to ear, absolutely adorable! And these from Jackie of La Casa de Sweets. Oh my goodness. So chocolate-y and topped with candy cane dust. 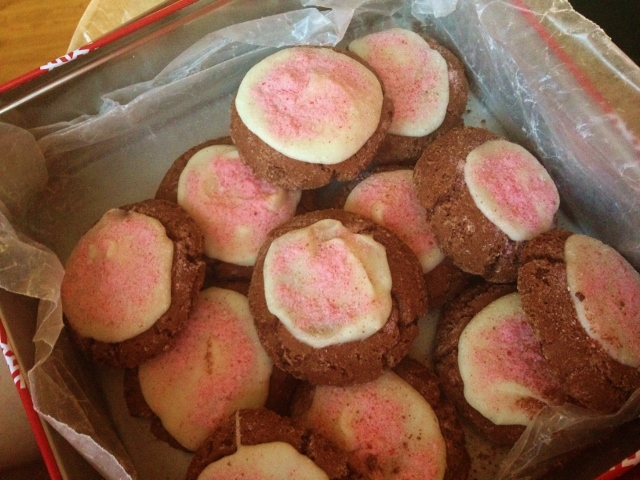 Fudgy Peppermint Bark Cookies…which should be called, “Disappeared in Minutes Cookies.” These were nibbled up super quick when I put them out to share with friends. I’m already excited to participate next year in The Great Food Blogger Cookie Swap. It was so much fun. And now…on to the recipe! Preheat oven to 350 degrees. Line a large baking sheet with Silpat mat or parchment paper. In a large mixing bowl, stir together almond meal/flour and baking soda. Add in oil, stirring well to combine. This will create a texture that is almost paste-like. Add in maple syrup, stirring well to combine. 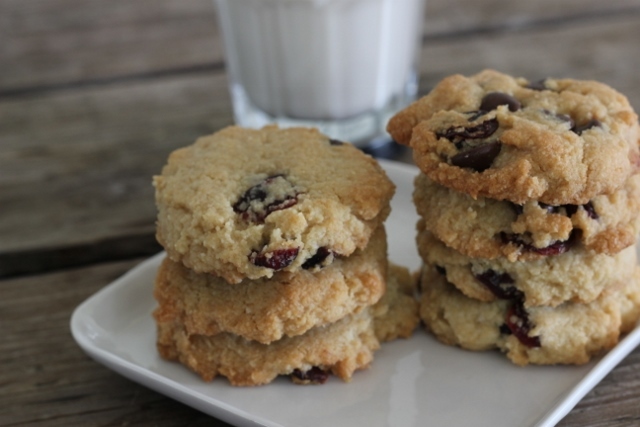 Gently fold in chocolate chips or chunks and cranberries. Using a cookie scoop, place dollops of cookie dough on baking sheet. You may either leave them in mounds or you may slightly flatten them with your fingers or the back of a spoon. Bake for 11 to 13 minutes, until just slightly browned on the edges. Allow to cool for a few minutes on the baking sheet and then move to a cooling rack to completely cool. Cookies may be stored in an airtight container. 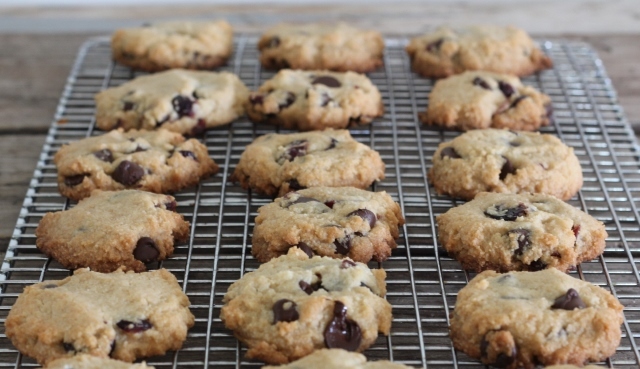 These freeze very well, either as dough or as baked cookies. « Green Bean Casserole, New and Improved!